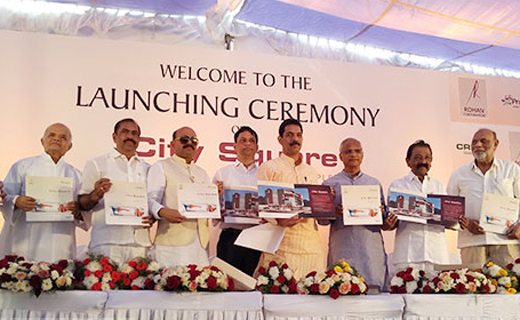 Mangaluru, Jan 19, 2019: The foundation laying ceremony of Rohan Corporation’s City Square commercial complex project at Lalbagh was held on January 18, Friday. The brochure of the new project was released by Dakshina Kannada MP Nalin Kumar Kateel. The new project was blessed by Fr Ravi Santhosh Kamath, Fr Wilson Vitus D’Souza and Ahmed Musliyar, Imam of Manjanady Masjid. Mayor Bhasker Moily, former MLAs Moidin Bava, JR Lobo , SCDCC Bank Chairman M N Rajendra Kumar, CREDAI President D B Mehta, Corporators Shashidhar Hegde and Jayanthi Achar, land owner Abdul Azeez, former MUDA chairman Suresh Ballal and others were present as chief guests. Chairman of Rohan Corporation, Rohan Monteiro in his address said he has completed 25 years in real estate business and thanked everyone for their co-operation.